The Vintage Radio and Phonograph Society Convention 2000 was held November 10-12 in Irving (Dallas / Fort Worth), Texas. The yearly convention spans a Friday through Sunday time period and provides up to four auctions, fellowship with those interested in classic and antique electronics equipment, and access to tube and radio gurus ("elmers" for you HAM radio guys). There is an equipment contest with several categories in which members may enter their items, and awards are given to the best in each category. A banquet is held on Saturday evening at which guest speakers entertain the attendees. Sunday morning is reserved for a 'swap meet' at which the junque is usually brought out..
OPCOM was able to get some impromptu images (please excuse the average quality of the images, as OPCOM's poor old Kodak DC40 digicam is almost an antique as well! ), and here they are for your enjoyment.. None of the images are labeled as to model numbers etc., but they do represent a small sample of the incredible variety of electronics items which show up here every fall season. Hope you see something you like! 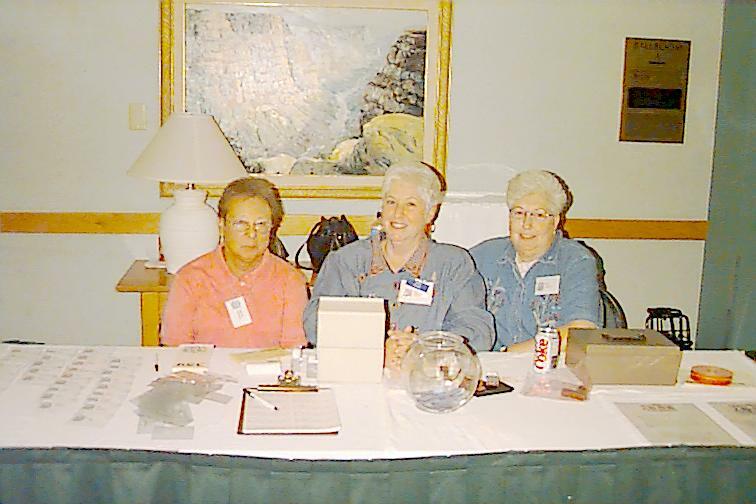 Some of our wonderful volunteer staff who worked the registration table for two days. The event could never be accomplished without the devoted efforts of these people and others like them. Our society owes them a great debt for their interest and hard work at these events!